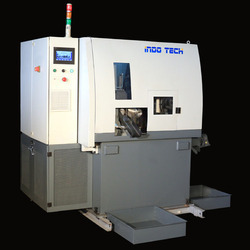 Offering you a complete choice of products which include auto loader circular sawing machine. To attain maximum client satisfaction, we have brought forward Circular Sawing Machine Auto Loader. It consists of a toothed or abrasive disc or blade to cut different materials using a rotary motion spinning around an arbor. Hole saw and ring saw also use a rotary motion but are different from a circular saw and used for cutting many materials such as wood, masonry, plastic or metal and may be hand-held or mounted to a machine.